Love that! He is hilarious, one of my favourite comedians/commenters. HAHA… thanks for liking my Christmas post! 😀 😀 😀 Good one! Ha, ha! Love it! 😉 ❤ Thanks, my new friend! Hi. I read like a fanatic as well. I think it’s part of being a writer. Good morning and thanks for stopping by! I write, but nothing I plan on trying to get published; yet. Maybe someday. Right now I am enjoying reading and editing for others. Thanks for sharing Diana! I would love to hear about your books if you would like to drop me an email! 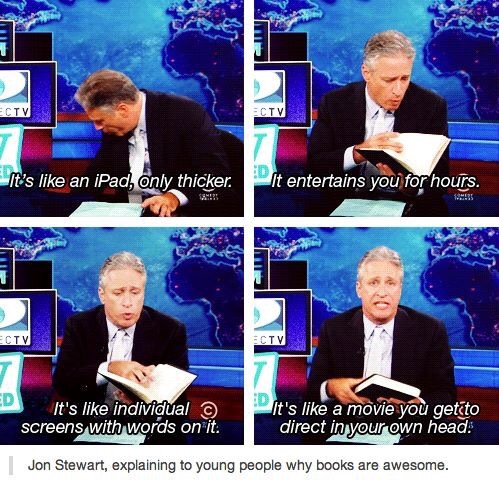 This is so true….with all the screens these days people forget the look, smell and feel of an actual book. =) It is so sad, really. Hey, thank you for stopping by The Fruitful Life recently and liking my post on adding a page (my Author Stuff). Thanks also for adding a little humor in your blog so we can see your personality.